It's this thing I have with shame where I'm ashamed of the fanart I draw, haha, so I don't want to draw it or finish it or show anyone, in case they're all like, "Oh well, you did this wrong and this wrong and this wrong-"
And you know what, what EVER. 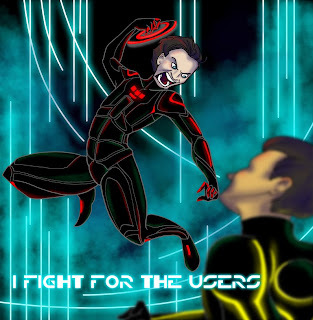 Here, I present my fanart of TRON Legacy; and guess what? THE COSTUMES ARE SO NOT ACCURATE, LOLOLOL. I also don't care, because I was having the time of my life. I freaking love these new light suits; and I even managed to track down a TRON font available online. Light suits were completely my own design, I couldn't find a decent enough reference to figure out how Rinzler's body armour was put together, so I made it all up. The most accurate parts are the lights, but I'm missing a number of those too. This definitely would have been an epic happenstance, and I could see it very clearly in my head. CLU gave me some complications, but I managed to tweak them into submission using photoshop. Some mist, some light, something to resemble the computerized Grid; and my personal favourite Gladiator. Best line in the movie, haha, "I fight for the users". Has anyone else realized TRON is a prophet and a religious martyr? I just clicked to that. I promise, eventually I'll stop being obsessed with a crappy movie, but I really, really loved it that much. What can I say? Going to buy it when it comes out on DVD.